START HERE: Read the "Two Step Action Plan for Your Family" a special report prepared for The Patriot Post by an Emergency Preparedness and Response Planning Committee, chaired by a member of The Patriot Post's National Advisory Committee, who is Director of the Center for Public Safety Planning. (Note: Print and retain plans and guides as you will likely NOT have Internet access when you need to utilize those guides.) As a minimal level of preparedness, we suggest you purchase compact "Get Home" and "Get Away" emergency response back packs. WMD Overview: Descriptions and Instructions - A detailed overview of what to do in case of a biological, chemical or nuclear terrorist attack. The following sections give thorough analyses on the various types of WMD that may be used in a terrorist attack. Emergency Contacts - Everything from the FBI and FEMA to the EPA, right here at your fingertips. Citizens' Preparedness Guide (PDF) - A guide prepared by the Department of Justice, USA Freedom Corps and the National Crime Prevention Council. It includes information on what to do in an evacuation, at the airport, at work, home or place of worship, as well as other generally useful plans. You will need Adobe Acrobat reader to open this PDF file. Family Preparedness Guide (PDF) - Disaster can strike quickly and without warning. It can force you to evacuate your neighborhood or confine you to your home. What would you do if basic services -- water, gas, electricity or telephones -- were cut off? This guide will give you the tools to deal with fire, flood, winter storm, tornado, hurricane or earthquake. Personal Preparedness Guide - A general guide including information on detection devices, gas masks, air filters, neighborhood watch groups and prepared traveling. Shelter-in-Place - Helpful hints for taking immediate shelter wherever you are -- at home, work, school or in the car. Emergency Preparedness Checklist (PDF) - A checklist for items to have and do in case of emergency. 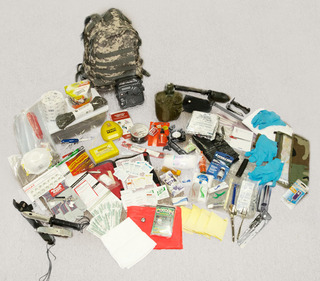 Emergency Kit (PDF) - Items you'll want in your own emergency kit. Family Disaster Supplies Kit - A comprehensive listing of basic items you'll need in case of long term confinement in your home. Food and Water in an Emergency (PDF) - A guide for the storage and use of emergency food and water. Personal Workplace Disaster Supplies Kit (PDF) - A good list of items you would need if confined at work overnight or longer. Wallet Personal Information Sheet (PDF) - A blank list for your own emergency contact information to be kept by each member of the family.